Experts on terrorism tend to claim that Hamas has shown high sophistication in unleashing waves of terrorism and perpetrating attacks against Israeli citizens. Some have been inclined to argue that Hamas is involved in intricate attempts to hinder the peace process, to change the government of Israel, and to act effectively and in calculated dosages to instill panic and cripple morale among Israeli citizens. The truth, however, is that we lack full and adequate data concerning decision making processes within Hamas, and concerning the ensuing mutual relationships between what is called the "political infrastructure" and the "military organization". We may even lack sufficient information about the coordination between various cells of the purported military organization, or between the two areas of the Gaza Strip and the West Bank. Some scholars even speak of several sub-organizations within Hamas, linked by different centers and interests, and grouped under one social-ideological- religious umbrella serving as the main binding factor. Since the forced release of Sheikh Ahmad Yassin due to the "Mash'al affair" and his return to Gaza, outside observers have sensed a certain restraint in the activism of the movement, not only in the implementation of terrorism. This might be a delusive calm, prior to their redeployment toward intensified action, or an attempt to ease Arafat's plight on the way to the second pullback. It may also reflect merely logistic difficulties. But could we perhaps view this as a period of Hudnah (a temporary cease-fire with the enemy in Islamic terms), and thus a deliberate policy imposed by the "political establishment" on the "military ranks"? Additional hypotheses could be raised, all suggesting that the movement has undergone a change over the last few months, yet all could rest on inadequate information and the next wave of attacks may now be in advanced stages of preparation. Hudnah, or "cease-fire," and certainly if initiated by Hamas, would indeed constitute real change, and not only at the tactical level. It would entail a significant shift in the social and political message of the movement to Palestinians in the Territories in general, let alone to its supporters. Any toning down of Hamas' inflexible attitudes toward Israel - accepting Israel's very existence as well as the readiness of national factions to compromise on an independent state on "half of Palestine" - is actually a step toward the inclusion of Hamas in the process of reconciliation as it has evolved over the last few years, despite all the halts and difficulties. This inclusion is crucial for Israel as well as for the Palestinian Authority. To some extent, it may sharpen the conflict within Palestinian society by deepening the "kulturkampf" between Hamas and the national leadership, which leans toward Western culture. Hamas would thus deflect its copious energy inward rather than focusing on violent struggle against Israel, and certainly when Palestinian society reaches the post-Arafat stage. Above all, changes in the radical attitudes and the political violence of Hamas against Israel and its citizens will attest that the movement is joining a process that is not only political, but also includes elements of reconciliation between Israelis and Palestinians in the social, cultural, and economic realms. This is a process that could be called "reconciliation through association rather than separation”. The architects of the "Oslo process”, or at least some of them, began by seeking complete separation between the two peoples dwelling in the land of Israel. Nevertheless, it would appear that the process actually supports the working assumption adopted in this paper: Israelis and their leadership on the one hand, and Palestinians and their leadership on the other, have been affecting each other since the onset of the Israeli-Palestinian conflict, in a process that has consistently strengthened the links between them rather than their separation. Resting on this assumption, we have attempted to consider whether Hamas is capable of a fundamental change of policy, showing willingness to "sleep with the enemy" while it is still and in the long range, the enemy. The extent, to which this process of reconciliation and mutual influence might include Hamas, is part of the struggle against terrorism and political violence. From a certain perspective, this paper will also attempt to examine what could be called the "reverse side" [Sitra Akhra] of the war against Islamist-Palestinian terrorism. Hamas is a public movement drawing mainly upon two ideological sources: one is the universalistic Arab Islamic doctrine of the Muslim Brotherhood, which strives to amend Arab-Islamic society toward the reestablishment of a traditional Islamic state. The second is the Palestinian doctrine of popular liberation, which strives to liberate the whole of Palestine with the aim of establishing a traditional Islamic state. In both cases, the central factor in Hamas' pragmatic considerations is reliance on broad popular support and high sensitivity to public opinion in the Territories. Sheikh Yassin, who had led the Muslim Brotherhood in the Gaza Strip since the Seventies, was the one who changed its attitude toward Israel from passivity to belligerent activism. Eventually, relying on the grass-roots Palestinian uprising, he remained the only real force carrying the banner of the Palestinian "armed struggle" in the era of compromise with Israel. Nevertheless, Yassin has remained in Hamas the most faithful representative of the ideas and socio-political doctrines of the Muslim Brotherhood, which he views as his first priority. Jihad is indeed the supreme value for the Brothers too, and members must prepare themselves throughout their lives for the time when the movement decides to implement it. Yet, on the way to Jihad there is room for pragmatism and flexibility, on which Islamic ritual sanction can easily be bestowed. Furthermore, the movement's extensive activity in all social, economic, and cultural realms is the key to the success of Jihad and of the movement's political course. This activity is accompanied by the principle of "endurance" [Sabr], as well as by the need to pause, occasionally, for organizational soul searching [Taqdir]. The rivalry between secular national groups - within and outside the PLO - and the Muslim Brotherhood - in the Gaza Strip and the West Bank - is not a result of the Uprising, or of the Oslo Accord, or of the establishment of the Palestinian Authority in 1993-1994. These events only shifted the struggle from the limited arena of student activists at universities to the public domain and, following the establishment of the Authority, to the conflict withHamas as the leading rejectionist element. The backdrop of this conflict, as emerges mainly in the writings of the Brotherhood but not in those of the PLO, are two contrasting worldviews relating to the character of the future Palestinian state and to daily life in Muslim society in general. Presenting these views as two conflicting worldviews, however, is too partial and simplistic. In the background are two deeper processes affecting Palestinian society and, more specifically, their influence on the Territories: the first is the development of the PLO, and mainly its "Gaza base”, which actually succeeded the Muslim Brotherhood as the central political factor during the Sixties. The second is the growth of a social and political structure of PLO supporters, particularly of Fatah, over the last decade; the mobilization of all political constituencies behind the "state in the making," and the place of Islamic factions within the power equation of this "state”. In regard to the relationship between the inhabitants of "Palestine proper" (referring to the Territories and, to some extent, to Israeli Arabs) and the Palestinian Diaspora, the course of development followed by the Islamic Palestinian movemen, and particularly by the Muslim Brotherhood, was antithetical to that of the national movement. Except for a brief period in the early Sixties, the national movement developed outside the borders of Palestine, endorsing universal and Arab ideas in an attempt to adapt them to a unique form of Palestinian patriotism. Not only did the ideology of Palestinian nationalism develop outside the Territories but so did its organization, even before 1967. Since 1948, the controlling influences in "Palestine" had been organizations perceived as hostile to the national movement and to the idea of democratic-secular Palestinian independence. Beside them were other influential forces, headed by Nasser's Egypt and the Syrian Baath party, for whom the liberation of Palestine was part of an Arab liberation movement rather than a wish to attain separate Palestinian independence. A situation thus developed whereby refugee camps, which enjoyed some freedom in Syria and an autonomy in Lebanon, together with Palestinian graduates from Arab and foreign universities, shifted the task of developing a national leadership beyond the borders of Palestine. The rapid development of the PLO as a political factor that gained Arab and international legitimization during the Seventies strengthened the unquestioned status of the outside leadership. Aided by Israeli action in this direction, it blocked the option of a local leadership emerging within the Territories. The perception of the PLO as the exclusive center of power within the Palestinian people was intensified during the mid-Seventies. The PLO invested strenuous efforts in mustering the support of a vast majority by creating a young and institutionalized infrastructure of middle ranks and "foot soldiers." This infrastructure swore unconditional obedience to the PLO, and consistently refrained from perceiving itself as the breeding ground of a local leadership placed beyond the dictates of the PLO. Jordan aided the process of "shifting the centrality of Palestine outwards" first and then by Israel; it also came to the fore in two additional factors linked to the Palestinian Communists. Palestinian nationalists within the Territories, drawing legitimacy from the PLO, rose mainly at the expense of the Communist party, which became a Palestinian party after splitting off from its Jordanian sources in 1982. At the April 1987 convention of the National Palestinian Council, the party became to some extent part of the PLO, albeit without endorsing its policy of armed struggle. The decline in the power of the Communist Party helped the PLO to eliminate an obstacle, in the shape of a Palestinian force located within the Territories that fails to heed the dictates of the national Palestinian leadership outside. Until the Palestinian Intifada, then, we witnessed a steady process whereby the political center of gravity is shifted beyond the borders of Palestine, strengthening the external national leadership at the expense of local forces. The relatively large and well-developed national movement that emerged through it, however, was hardly affected by the local inhabitants until the Intifada began in December 1987. In contrast, Islamic Palestinian movements developed their ideological approach inspired by outside sources, but their organizational underpinnings were within "Palestine proper". Furthermore, two of these Islamic movements grew within the Territories themselves, attempting to develop and spread an ideology meant to serve the entire Islamic world. These were the "Islamic Liberation Party," which evolved as a Palestinian movement although it expanded to the Arab world, and the revolutionary arm of the Palestinian Islamic Jihad, which espoused the view that Palestine and its struggle for liberation provided a model for the liberation of the whole Islamic world. The Muslim Brotherhood is the prototype of an Islamic movement following a course of development contrary to that of the PLO. The Palestinian branch of the movement was established in 1945-1946, in answer to two features characterizing Palestinian society at the time. One was the split between the political Islamic element and the national leadership, even if the latter was headed by a religious figure, Haj Amin al-Husseini. The second was a perception of the Palestinian struggle as inseparable from the struggle for the liberation of the entire Muslim world. The growth of the movement after 1948 was marked by ideological and organizational subordination to the parent movement outside Palestine. Until 1967, the Palestinian branch in the Gaza Strip had been part of the Egyptian movement, or fully controlled by the Jordanian movement in the case of the West Bank. The two branches were completely detached territorially, while in the third area, where the state of Israel was established, no trace remained either of the movement or of the Islamic establishment as a whole. Relationships with the Muslim Brotherhood in both Egypt and Jordan had a vast impact on the Palestinian branches. The fierce struggle between the Egyptian Brothers and the government of Nasser led to a significant decline in the status of their members in the Gaza Strip and in their levels of involvement, although most of them did remain active and were not subject to imprisonment, exile or executions, as their fellows in Egypt. In the West Bank they were part of the Jordanian movement, and thus enjoyed relative freedom of action. But, at the same time they also became involved in internal Jordanian issues or in its relationships with its rivals in the Arab world, and lost much of their Palestinian character. Before 1967, Fatah had represented the main threat to the Muslim Brotherhood, particularly in the Gaza Strip. The path to the liberation of Palestine and the character of the state after liberation were key questions in the Brothers' relationship with the PLO. The central problem, however, was that the PLO and other elements, such as the "Arab nationalists" [Al-Qawmiyyun al-Arab] came to be perceived as a tool for introducing into Palestinian society "heretic ideas from the West and its Arab lackeys". Youths from the Gaza Strip pouring into the PLO ranks symbolized a social and cultural change in Palestinian society. National strivings were not only a source of hope and expectations, but also encouraged social processes that were more appealing than the Brotherhood's Islamic call. The competition with the PLO thus took on a social rather than a political dimension. During the Sixties, relationships between the Egyptian regime and the Muslim Brotherhood also deteriorated considerably, affecting the Brothers' organizational options. Competition with Fatah and the PLO was no longer balanced, and many youngsters abandoned the Muslim Brotherhood and joined the new movement. PLO members, whether because of their previous membership in the Brotherhood or because of the religiousand traditional values characterizing their upbringing, preserved a certain Islamic demeanor in the movement. Yet for the Muslim Brothers, this demeanor was not Islamic, and represented a threat even more dangerous. Contrary to Palestinian groups that upheld Marxist ideas, from which the Muslim Brothers could easily set themselves off, Fatah, was for them a secular movement in Islamic garbs. In practice, it encouraged secularization processes typical of Western culture, even if some of their members preserved Islamic ritual practices. The struggle between the Brotherhood and the national factions of the PLO thus assumed social and cultural dimensions. In light of the Brothers' organizational difficulties, their response was to emphasize their message [Da`wah] as a social welfare mission, at the expense of their political ideas. When the Brothers were no longer the main organization in the Gaza Strip, they desisted from their struggle against the Egyptian administration or against their secular rivals within society, choosing to focus on the crux of their doctrine: the amendment of society through the Islamic power bases remaining within their control. In fact, from the mid-Sixties, the Muslim Brotherhood became anideological movement that concentrated on religious preaching at mosques and on the running of secret charity associations. The creation of the PLO in May-June 1964, and the subsequent generation changes in its leadership, also symbolized the process of "away from the center”, from "Palestine", toward the Arab capitals. Israel's entry into the Territories in June 1967 accelerated a process that had actually begun several years before. The "changing of the guard" brought to the leadership of Palestinian nationalists a new generation of university graduates who had studied in Arab countries aided by broad Arab support, and had therefore lived for long periods outside the Territories. Some were residents of refugee camps in Arab countries, and even when they had preserved a close attachment to their birthplaces in "Palestine", these were often Arab villages now within the borders of Israel rather than in the Territories. Most of the new generations of Palestinian national leaders were refugees from Arab villages now controlled by Israel rather than permanent residents of the West Bank or the Gaza Strip. The 1967 war concluded a process that forced the entire Palestinian leadership to concentrate outside the Territories. After 1967, the national leadership - both that of Fatah, which gradually became the leadership of the PLO, and that of the Marxist organizations - built new bases in the Territories relatively quickly, by means of the armed struggle and the military and terrorist deployment. During the Seventies they also engaged in the building of a social and political infrastructure, which turned Fatah into the dominant force within the Territories. For the Muslim Brotherhood, 1967 seemed to mark no real change. Ideologically, they continued to adhere to the Islamic solution of liberation through Jihad, including the liberation of the Islamic State after its establishment. These changes in the national Palestinian leadership symbolized for them the continuation, and even the intensification, of a cultural process they perceived as bordering on heresy. Hence, they persisted in their efforts to expand their power through persuasion and social action. In the West Bank, and for many years, they continued their activities as they had under Jordanian rule, particularly since their economic base - the Waqf establishment - remained under Jordanian control and did not suffer from Israeli interference. Conflicts with the Israeli government on Islamic issues were handled by the Supreme Muslim Council in Jerusalem, without their intervention. It was particularly in the Gaza Strip that they demonstrated their powers of survival. In 1969-1971, there were waves of severe disturbances and active opposition to Israeli rule in the Gaza Strip, including acts of terrorism and internal violence aimed at imposing the dominance of the national organizations. The Muslim Brotherhood as an organization, as opposed to religious individuals implementing the Brotherhood's policy, systematically refrained from any involvement. Preachers in the mosques were anti-Israeli and even anti-Jewish, but this was not a sweeping phenomenon, and they did not engage in any other activity. The movement in the Gaza Strip persisted on the line it had already adopted in the early Sixties. It emphasized the Islamic Da`wah, charity, cultural and social activities, and the distribution of imported Islamic literature, with the aim of expanding its influence. During the Seventies, the influence of Arab Islamic groups first and foremost the Egyptians, came to the fore in the tendency to view Arab regimes as part of a Western cultural plot against Islam. There were no differences on this score between the various Islamic movements, and the conflict focused on the ways of removing these regimes and building the Islamic State that would replace them. This became the dominant approach and spurred the Muslim Brotherhood and other Islamic parties in the Arab world to engage in a struggle against most Arab regimes. In the Territories, there was no parallel Arab regime against which to struggle. The Muslim Brotherhood did not endorse the approach of the Islamic Jihad, which viewed the struggle against Israel as spearheading a solution appropriate to the whole Islamic world. During the Seventies, therefore, the struggle of the Brotherhood proceeded in the social-cultural realm, while nationalists provided a justification for it even without the Palestinian, Arab, or Israeli political context. An additional element developed in the Territories from the late Seventies onward. The national Palestinian infrastructure led by the PLO, and particularly by Fatah, gradually came to be perceived as the national leadership of a "quasi-state". This was mainly due to social changes linked to the development of education, and to demographic processes expanding the leadership ranks to include younger cadres as well as members of families that did not belong to the traditional aristocracy. The claims raised by comparable Islamic parties against the regimes in their own countries could also be raised, presumably, against the "Palestinian regime" in the Territories led by Fatah/PLO. There was, however, one significant difference. The PLO could not be presented as a regime that oppressed its inhabitants or acts in the despotic fashion attacked by Islamic groups in Egypt, Syria, and other Arab countries. A further difficulty was the doctrine expounded by Sayyid Qutb in the Sixties, claiming that social and political oppression were the primary criterion in the Islamic struggle. Islamic groups took exception to the corruption, to the comforts enjoyed by PLO activists, to the waste at the expense of the "Palestinian people choking under the yoke of Israeli occupation", to involvement in inter-Arab conflicts rather than in the Palestinian problem, etc. Yet these claims were raised mainly against the leadership of the organization abroad, as the ranks of Fatah and other PLO groups within the Territories were not a justified target of such allegations. Even when these accusations were raised against PLO activists in the Territories, they tended to focus on issues of personal corruption, loose morals, and aiding the "Jewish enemy" by corrupting the young generation. Hence, the Muslim Brotherhood and other Islamic factions reacted as they had for several decades, by pursuing their attempts to amend society. From the late Seventies, then, the conflict with the PLO/Fatah remained at the cultural/social level, although for the Muslim Brotherhood and other Islamic parties this level was not only no less important but rather closely linked to the political one. The reason for the growing confrontation between the nationalists and the Muslim Brotherhood during the Eighties, besides the cultural conflict, was a growing sense of power developing within both parties. A new dynamic had been set in motion, cnew power bases within the Territories that began to emerge as a political institutional infrastructure. The universities were the leading bodies, but other institutions also developed. Beyond their political mission, these institutions were also an instrument for developing a Palestinian cultural-social consciousness in the Territories. From the start, this consciousness evolved in a national-secular direction, mainly influenced by the new generation that had brought it about. But the new political infrastructure and the power centers it created introduced new "rules of the game" in the West Bank and later in the Gaza Strip. The political culture created in the Territories was the one set up by the national factions. To contend with them, Islamic elements led by the Muslim Brotherhood had to play by the same rules. The organizational development of the national factions brought along a similar development in the Brotherhood, although characterized by Islamic features. The foundations of this organizational development were not new, and were grounded in their doctrine in Egypt. Islamic activity at institutions of higher learning was also similar to that current in Egypt and in other Arab countries. The Muslim Brotherhood, in a limited fashion, had also been politically active in Jordan from the Fifties. What made Islamic factions in the Territories unique was their ability to contend with the national factions. Nationalists were portrayed as secular and as bringing apostate Western culture (some deliberately, like the left, and others innocently and involuntarily, like some of the PLO supporters), into the quasi-national domain. At the same time, the fight for Palestinian independence proceeding in the Territories gave Islamic groups a chance to participate, if not at the military level, then at the political cultural one. The struggle in the Territories, then, assumed the typical features of a struggle for political independence although, contrary to the past, it was the local population rather than other sections of the Palestinian Diaspora that were leading it. This process was sustained by the national infrastructure that had been building up since the mid-Seventies, which was also instrumental in preserving the PLO's most vital asset. Since this infrastructure was directed and financed by the PLO/Fatah, the PLO retained control of it even after its headquarters had left Lebanon in 1982-1983, and Jordan in the summer of 1986. These frameworks remained committed to the various ideological factions within the PLO, and did not develop independent approaches. The only element that appeared to be autonomous were the independent groupings, put together for terrorist purposes, which had proliferated since the mid-Eighties. Ultimately, however, they fitted the PLO's strategic conception, proving that the struggle against Israel was not only conducted from the outside but was also the natural response to a "cruel and abusive occupation" from a people with a developed national consciousness. Some members in these groupings also identified with one or another of the movements within the PLO and, generally, all identified with its notion of liberation and with Arafat as the ruler. One consequence of the buildup of national power in the Territories was to hasten the establishment of an independent entity in the Territories, namely, in part of Palestine only, while conceding the need for a process that would necessarily require the recognition of Israel. This step was completely opposed to the ideas of the Muslim Brotherhood and other Islamic elements. In their view, this would imply establishing yet another Arab Muslim State in the context of the national fragmentation characterizing the Islamic Arab world today, to be led by people bearing the banner of secular nationalism. Worse still, this state would join the existing Arab states serving renegade Western culture in its war against Islam, and preventing the Islamic word from establishing the great Islamic Caliphate. From the beginning of the occupation, the Brotherhood was prominent as a body that acted separately from, and for twenty years even against, the national factions. The development of the national infrastructure in the Territories as a "state in the making" gave the Brotherhood the appropriate domain for highlighting its uniqueness against the national elements. In their traditional strongholds - mosques, religious events, Islamic bookshops, charity organizations, and the Waqf system - there had been little friction between its members and the national elements. But when Islamists entered the main nationalist stronghold in the universities during the Eighties, they were forced to stress their singularity and create the rivalry. The struggle at the universities largely determined the essence of the contest that was to develop later, including during the uprising. The Islamic arguments against the Palestinian national leadership abroad which, as noted, were inappropriate in the local context, began to focus increasingly on political aspects. Given that national factions in the Territories were in full agreement with the PLO's political line, the Muslim Brotherhood shifted their rivalry with the PLO to the Territories. The social network where they had begun their activity, which had grown at the initiative of the national bodies, and the focusing of the Palestinian cause on the Territories and their inhabitants, gradually turned the local Muslim Brotherhood into a movement that was first Palestinian, and only then part of the international Islamic movement. The solidarity of the Muslim Brotherhood, which had strongly emphasized Islamic pan-Arabism before 1967, was gradually limited to the area of the Territories from the late Seventies. As a PLO inspired national consciousness developed in Palestinian society as a whole, the Brotherhood became more Palestinian, and this was openly and concretely demonstrated in their involvement in the Intifada and in the Islamic Charter they published in its course. The insistence of the Muslim Brotherhood on following its own direction and preserving its character and uniqueness were wholly its own initiative. Nationalists, certainly those in Fatah but also in Marxist groups, did not seek conflict with the Brotherhood, and most of the friction between the two sides, at the universities as well as in the public arena, resulted from Islamic initiatives. When a "state in the making" started to emerge in the Territories, the Brotherhood began to act more assertively to expand its services and strengthen its influence. Public feeling in the Territories that a solution was in the cards influenced both parties to increase their expressions of support for one or another line. On the national side, the young generation was almost wholly identified with one of the PLO factions, leaving almost no political vacuum. On the Islamic side there was a growing feeling that, as negotiations intensified and the focus shifted to the Territories themselves, the ranks of those supporting an Islamic solution of the problem should be broadened. The passivity in the active struggle against Israel, which was displayed by the Muslim Brotherhood in the Territories and by Islamic and Arab elements, moved a minority of Islamic intellectuals to place Palestine at the top of their priorities and led to the creation of the Palestinian Islamic Jihad. The emergence of Hamas at the outset of the uprising was a direct continuation of the Muslim Brotherhood. It marked a change of course rather than a new organization. The Intifada did not change the basic attitudes and the rivalry between the parties. Hamas, which symbolizes the enlistment of the Brotherhood as an active party in the struggle against Israeli control of the Territories, particularly its military rule, and as a socio-political alternative challenging the PLO, could have changed this relationship. The Brotherhood's abandonment of the policy of voluntary abstinence it had endorsed for over Twenty years when it joined in the general struggle seemed to bring it closer to the general aspirationof most Palestinians in the Territories. Even in the Intifada, however, the Muslim Brotherhood consistently refrained from cooperating with the national leadership of the uprising and adopted a separatist line, both ideologically and organizationally. From the outset, its members claimed they had sparked off the uprising; they established their own organization and refused to participate in the "United National Command". From the spring of 1988 they began publishing separate statements, including instructions that differed from, and at times contradicted, those issued by the UNC. In the statements and publications issued in the Territories, and even more so in the newsletters issued by their supporters abroad, particularly in Europe, they persisted in a line that preserved the ideological split with the PLO as it had prevailed before the Intifada. In other words, all the activities of the Muslim Brotherhood during the uprising sustained the intense ideological rivalry that had prevailed before it. Their success in the Gaza Strip, and the expansion of their services in the West Bank, strengthened their sense of power and their faith in the justice of their cause. Their actions before and the uprising could be summed up as "swimming against ttide". Until the outbreak of the Intifada, this came to the fore at the level of the armed struggle and, during the uprising, in their stubborn resistance to any political process culminating in a solution that appeared to them only partial. Any form of agreement was construed as acquiescence with the "greatest cultural-political enemy of Islam", namely, Western culture, represented in the area by the Jewish entity. The establishment of the Palestinian Authority, which seemed to many Palestinians as the preface to a Palestinian state in these areas, instituted a process wherein the Muslim Brotherhood could become the Islamic element struggling against the national Palestinian regime, as is true of other Arab states. These issues concern not only political questions or the peace with Israel, but also key matters on the Arab agenda in general: democracy and its meaning, Islam v. Arabism, and questions concerning the contest with modernization, where the parties are also fundamentally at odds. “The house of the PLO is the house of the Palestinian homeland. Hence, any attack on the PLO is an attack against the homeland. The organization is the state rather than a party within it, a fact that many of the renegades in our midst have long ignored. They have invested efforts in creating an alternative to the state-homeland-organization, and have drowned in the sea. Today, a dear group in our midst strives toward the same aim. We do not long for their downfall, but come to warn them. We wish to prevent them from falling into the trap devised by the enemies of the nation and the homeland. "Warn the close members of your tribe." We proclaim that the organization is the homeland and not a party within the state." “We want the state to create an Islamic society where Muslims and non-Muslims become aware of divine justice, Islamic freedom and human principles. No exploitation, either of Muslims or non-Muslims, will prevail in this society. There will be no harm to the freedom or the property of Muslims or non-Muslims. We want a state where the citizen will make a decent living, will not be unemployed, and will be humbled only before Allah”. Beyond the rhetoric, this text brings together the national democratic state of the PLO, and the principles of an Islamic movement of the Muslim Brotherhood variety. The Brotherhood's main formula in the Territories, particularly in the two decades preceding the Intifada, was to focus on community action. They thereby gained a foothold in several public sectors, mainly in the Gaza Strip but also in the West Bank. They focused on what they called Da`wah - community development and the provision of welfare services to broad sectors of the public, not necessarily religious ones. The principles of their Da`wah did not differ from those of the Muslim Brotherhood in Egypt, according to the pattern set by Hassan al-Banna in his lifetime, although the relative freedom of action they enjoyed under Israeli rule enabled them to expand their activities. Preserving the organizational structure of the movement. Clearly separating the internal activity of the movement and the instruction (Tarbiyyah) of its members from its public Islamic activity. Stressing the uniqueness of the movement's organizational approach and its doctrine (Manhaj), as opposed to those of other Islamic movements. The stress on the Brotherhood's Manhaj as opposed to that of other Islamic groups, together with the freedom of action they enjoyed, turned it into a closed organization unwilling to cooperate with other groups, whether Islamic or national. In the Gaza Strip there was almost no competition from other Islamic groups, until the growth of the Islamic Jihad in the mid-Eighties. In the West Bank the movement endured limited competition from the Islamic Liberation Party (Hizb al-Tahrir al-Islami), whose founders had been members of the Brotherhood in the early Fifties, and from Islamic groups that had no political aims. Not only were the latter no rival, but thactually encouraged socio-cultural processes entailing a return to Islam that, ultimately, worked in favor of the Muslim Brotherhood as the dominant Islamic element. The Islamic Liberation Party also functioned as a closed group fiercely preserving its independence, entangled in a turbulent struggle with the regime. The Brotherhood had no political rivals in the West Bank either. The main ideological rival was the Jordanian Communist party which, from the early Fifties, had also been harassed by the Jordanian government both in Jordan and in the West Bank. Other groups, such as the Baath Party and national and Marxist Palestinian factions active in Jordan during the Sixties, were persecuted or restrained by the government until the fatal blow of "Black September" 1970. This reality marked by an absence of real political rivals until 1967 and in the Islamic domain even until the Eighties, led to a standstill in the organizational approach of the Brotherhood in the Territories. In the West Bank, they also retained their affiliation with the Jordanian parent movement for a long time, and remained part of the Waqf Islamic establishment. This establishment remained closely allied the Jordanian government, even after the Israeli occupation of the West Bank and even aftKing Hussein announced the separation of the two banks in July 1988. Unlike the situation in the West Bank, where the Waqf had remained under Jordanian control, no trace of Egyptian rule was left in the Gaza Strip. The Waqf and the mosques there were loosely controlled by Israeli military rule, and by the civil administration that succeeded it in 1981. Therefore, while concentrating on Islamic communal-cultural activity, the Muslim Brotherhood managed to develop a relatively broad Islamic infrastructure that included dozens of private mosques, almost without interference from the Israeli government and sometimes with its encouragement. Since the Brotherhood and other Islamic groups kept away from the armed Palestinian struggle in the Territories until the growth of the Islamic Jihad in the Eighties, their political rivalry with nationalists was to some extent blunted. As the Brotherhood placed stronger emphasis on its social-communal-cultural activities, its rivalry with the national factions focused on cultural dimensions, almost regardless of the Israeli government. The national socio-political infrastructure developed in the Territories from the mid-Seventies turned them into a quasi-state. The weight of the Israeli government was felt mainly in its fray with those who were openly subversive or involved in terrorism, and had no effect on internal bases of power, first and foremost the institutions of higher education. As these bases developed, at the initiative of nationalists and controlled by them, they sharpened the violent confrontation with the Israeli authorities, which responded by strengthening its restrictions. As a result, broader sectors entered into the confrontation, and increasing sections of the population in the Territories challenged Israeli rule and acquired a national political awareness. Led by the PLO, this awareness took an increasingly national-secular character; given the withdrawal of the Muslim Brotherhood from any active confrontation with Israeli rule, Islamists came to feel more culturally threatened by Palestinian nationalists than by the Israelis. The encouragement they drew from the Islamic revival in the Arab world, and particularly in Egypt, shifted their concern to a confrontation with those who were actually perceived as the dominant element in the Palestinian public - the PLO and its components. The institutions of higher learning created a new focus, which turned into an arena of internal political-cultural confrontation and was almost unconnected to the Israeli administration. The emergence of a socio-political infrastructure, as well as the incipient signs of independent Palestinian institutions in the Territories, led to a cultural-social confrontation over the character of the quasi-state, resembling circumstances in other Arab states. The Tarbiyyah of the Muslim Brotherhood, which had consistently combined the cultural and political levels, became central. Furthermore, given that the growth of the secular national infrastructure was accompanied by the intensive development of a social-communal infrastructure, the Brotherhood's focus on a similar realm of activity became highly relevant in their contest with national elements active in the same domain. Since this was a society involved in a national liberation struggle, violence was directed against the Israeli occupiers, while the inner contest between Islamic and national elements remained relatively bloodless, limited to cultural and social competition and vying for elected office. These developments gave strong impetus to the organizational activity of the Muslim Brotherhood, particularly in the Gaza Strip, where they acted as totally independent agents, free from all external influences or organizational links with other Islamic fellows. This momentum also led to the distribution of their own teaching material, used to instruct their members and to emphasize the cultural and educational foundations of their doctrine. The most prominent element in the Tarbiyyah of the Brotherhood is the stress on the group as vital component of its activity. The group must conduct itself in an orderly and appropriate manner, as it is surrounded by enemies and acting within a community of heretics. In fact, the Islamic community is under siege, and the group is one of its most important means of defense. Furthermore, the dangers lurking on the path of the Islamic public and the Islamic group are not only external but also internal, and the Muslim Brothers must be in "constant readiness" and take defensive measures (Wiqayah) against them. The sense of siege is twofold, including the wider circle of the community that can be defined as Islamic and, within it, the Islamic group functioning in a more limited circle. Hence, the group feels itself under siege when faced with the broad "heretic" community, but faces danger even within it. It must therefore act in great secrecy, and instruct in its methods only the most reliable sections of the public. Its foremost organizational tool in the practice of secrecy is the "family" ('Usrah), the basic cell of the movement. The 'Usrah is not equivalent to the organizational cell common in other movements or parties but rather, as its name indicates, a family. Its aim is, inter alia, to develop a setting in which members are not only movement activists but also united in a familial framework and solidarity. The internal material that the Muslim Brothers distribute among their activists in the Territories includes no references to the Israeli-Jewish or non-Muslim government controlling the area, or to the reality of life within the Territories. The focus is on an Islamic group active in a renegade Muslim society. Partly, this is a result of the material's reliance on literature issued by the Muslim Brothers in Egypt and Syria, as attested by the list of sources and the suggestions for further reading. Nevertheless, the reason could also be that the Islamic social revolution, and the activities concerned with halting the "social erosion" of secularism, were perceived as more burning problems than the Israeli occupation. Furthermore, the purpose of the Brotherhood's activity is to prepare Muslim society for a Jihad designed to bring about a renewed Islamic state. This aim is to be achieved only when most of society has adopted their views and amended their ways in light with their approach. This approach characterized their activities for the first twenty years of Israeli rule in the Territories in the years 1967-1987, when they consistently refrained from any confrontation and focused on the Da`wah within the surrounding Palestinian community. During the period of the uprising as well, when they joined in the armed Palestinian struggle and in the civil insurrection against Israeli rule, they continued to direct most of their anger at the secularnational elements. They also continued to emphasize the cultural struggle surrounding not only the ways of establishing the future state and its borders, but also its future character. "The activist must begin his efforts within the circles of the faithful, but it is forbidden to withdraw and abandon the sinners. Many have been seized by modern heretic (al-Jahiliyyah) secularism (al-Madaniyyah), by the non-religious culture of the educational system, and by a search for amusement, and have never in their lives encountered a preacher or a guide. Their foundations are nevertheless good, and they have not developed in their hearts notions of evil, corruption, and decadence. They have merely taken refuge in them accidentally and due to self-indifference... Contact with them need not lead to their entry into the cultural framework [of the Islamic movement] for it to be considered wholly successful. This is indeed the highest level of success, but there are also others. The individual may remain throughout his life within circles of supporters and sympathizers, and we must benefit from it to the best of our ability, in form of financial contributions, secret information, or access to others. This link with the renegade society is highly instrumental: "This will enable us to exploit the renegade society, making it easier for us to eradicate its corruption and its government". The approach of the Muslim Brotherhood to the existence of the State of Israel is not founded on a struggle against Israel or the Zionist movement specifically; rather, it is part of the perennial historical struggle between Islam and Judaism. This struggle, according to radical Islamists, begins with the attempts of Jews in the Arab peninsula to prevent the prophet Muhamad from spreading the true religion and bringing his mission to the world. This is a struggle between two worlds, when Judaism is described as seeking to abolish the power of Islam and prevent its expansion, thus paving the way for its defeat. The only answer to this confrontation, which is essentially religious and cultural rather than military, is to reestablish the great Islamic State. For this purpose, the first stage is to amend society through a political organization that will spearhead the Islamic cause in this cultural war. The amendment of society in the various Arab countries, in the spirit of an agreed view of Islam, is the key to the eventual creation of the long awaited Islamic State. In other words, rather than a direct conflict with the West, Jihad is, first and foremost, a struggle to remove its influence from Islamic society. This influence has grown increasingly prominent during the Twentieth century, and particularly since the Arab states became independent. Western culture secured an important achievement at the stage of independence, when heading the newly established states were regimes that served the West and deepened its cultural and economic grip on the Islamic world. Taking this as their starting point, the Muslim Brotherhood developed an interesting approach toward the place of Palestine in their view of Jihad, with further implications for the struggle with Israel. This approach rests on two basic elements: one claims that Palestine is an Islamic land that cannot fall under non-Islamic rule. Jewish rule over Palestinian land is the most prominent symbol of Islamic defeat to its foremost enemies. Palestine, then, must return to Islamic rule in its entirety. The second is that the struggle to liberate Palestine from Jewish rule is not an end in itself, but part and parcel of the strivings to unify the Islamic world. Hence, liberation is not only the task of the Muslim Brotherhood or of Islam's supporters within Palestine. Liberation is a religious commandment equally incumbent on all Muslims, inseparable both from their own struggle to be released from the shackles of Western culture, and from the holy yearning to unite the Islamic world. What is interesting in this approach toward Israel is the paradox it somehow entails: on the one hand, Israel is Islam's foremost enemy in the religious and cultural confrontation. On the other, the immediate solutions to the problems of the Islamic world will be found within Islamic society itself, in the cultural rather than the military realm. Hence, the solution of the Muslim Brotherhood, in the Palestinian or the Israeli contexts, fundamentally postpones the direct struggle with Israel to later stages, after the self-liberation of Islamic society. More than that, since the key to Islam's victory lies in the reestablishment of the great Islamic state headed by an Islamic ruler (Khalifah), only after creating this state and electing its leader will the latter be able to mobilize the Islamic forces required for the military Jihad leading to the liberation of Palestine. The principles of Hamas sharpen issues touching on its "logic of Islamic terrorism," and particularly Israel's ability to influence this logic as part of counter-terrorism. Post factum, and as a matter of academic concern, we could ask whether it might not have been better had Israel released Yassin several years earlier and at its own initiative, rather than under duress and in disgraceful circumstances, both political and operational. We may even risk asking whether Israel could have avoided the escalation of terrorism, and spared a considerable number of the suicide attacks that began in April 1993 next to Mehola. These are not fit questions to ask from those concerned with the historical study of what took place rather than with what did not. But since Israel is in the midst of a war against Palestinian Islamic terrorism, albeit with brief or prolonged periods of respite, this is a legitimate topic of discussion. Terrorism or political violence of any kind - religious, ideological, national, anarchist, or other - are not a "heavenly scourge," but the war against them need not be waged solely through the military means to which we have become accustomed during our protracted struggle against national "secular" Palestinian terrorism. "The Oslo accord" and the ensuing gradual thawing was, and still is, an important stage in the struggle against national terrorism. Even if this process ultimately fails or is suspended for a long time, or if Israel returns to another "round" of violent confrontation with the Palestinians in the Territories, it has won several years of an almost complete halt in the nationally-based terrorism of the PLO and its leading organization. Think of what could have happened had "suicide" attacks become current among nationalist Palestinian organizations, which would certainly have added social deprivation to the Islamic incentives encouraging such attacks. Israel would then be facing a kind of "Islamization" of terror, in a society that is in any event traditional and mostly faithful to Islam. This was indeed the case in two instances: the Palestinian stabbings that preceded the terrorist suicides, and the suicide attacks against IDF soldiers in Lebanon during the Eighties by national and Marxist organizations, following a series of attacks by members of Islamic and Shiite organizations (Amal and Hizballah). Palestinians we define as "secular" would easily be willing to engage in individual terrorism. Relying on scanty means, shouting "Allah Akhbar" and with a copy of the Quran in their pockets, they would believe they are thereby turning into Shuhada' (holy martyrs) and engaging in an Islamic Jihad that is also social and national, saving not only their own souls but also society and the homeland. A perception of the political process as inseparable from the war against terrorism requires vision, and the ability to read the enemy's map correctly. Palestinians became increasingly adept at it from the early Eighties, as they gained familiarity with Israeli so. This familiarity was also crucial to some of the elements that sparked off the Palestinian uprising in December 1987, and particularly to its prolongation. However, it also brought some of the PLO leadership, as early as the mid-Eighties and before the Intifada, to understand that terrorism was about to be exhausted and that if Palestinians wished to attain national independence, even if only partial, they must turn to a political process. Moreover, Israeli society was also ripe for change, and segments of it were even yearning for such a process, be it because of weariness or because they had reached "political maturity." The war against terrorism is not meant to be waged only in the realms dictated by terrorism, by resorting to defensive or aggressive strategies or to some combination of both. It also requires a social-political vision. An example offered here concerning the "logic of the war against terrorism" might evoke some angry responses as it touches a taboo - the logic of liquidating Abu Jihad. Abu Jihad was indeed a crucial figure in the terrorism sponsored by the PLO, and even more so in the successful mobilization of most Palestinians in the Territories to support it, either passively or actively. Had he not been killed in April 1988, a few months after the Intifada flared up in the and was co-opted by the PLO/Fatah, it is plausible he would have become one of its key leaders. Given the state of relations with Jordan at the time, which in July 1988 renounced its political assets in the Territories, King Hussein might also have allowed him to return to Jordan after his expulsion in July 1985, thus easing his way to a leadership position. But anyone acquainted with his activity and his life's work, and particularly with his loyalty to Arafat, could just as plausibly assess that he might have become Arafat's right hand in the move toward political compromise that began in 1993. Furthermore, it is also highly probable that Abu Jihad would have become the central authority in the Territories on issues of security and the struggle against the Islamic organizations. The "Rajoubs," the "Dakhlans," and other heads of the security agencies in the Palestinian Authority, as well as some of the governors in these areas, are his disciples. The Palestinian Islamic organizations also held him in great respect for reasons to do with his character and his relationship with them, in contrast with their open contempt for Arafat and his associates, described in materials issued by the Muslim Brotherhood long before the uprising as "swinging with the jet set in fancy hotels". It is not my intention to praise Abu Jihad here but to consider the shortsightedness of those who killed him. Satisfying needs for revenge among those who eliminated him in a brilliant operation deserving military acclaim, is not necessarily synonymous with political vision and long range wisdom. The widespread use of an expression much beloved to Israeli security forces, "pinpoint targets," may preclude awareness of the fact that only a collage of points creates a full picture. One could counter by claiming that in April 1988, at the height of the uprising, it was impossible to envisage the changes taking place in the PLO or the chances of a compromise. The answer is that a sobering process had begun in the PLO during the Eighties, even before the Intifada, and had been discerned by the Israeli intelligence community. The political echelons in Israel, however, in the two main parties and in the government of national unity, were not yet ready to accept this. The closure of the Palestinian headquarters in Jordan in July 1985, and the parallel expulsion of their members to far away Tunisia, had their effects. Furthermore, in March-April 1987, signs of this change within the PLO greatly hampered the ability to convene the National Palestinian Council. It finally met in Algiers following a forced compromise brokered by the USSR that brought the Palestinian Communist Party, which supported an agreed partition in Palestine, into the PLO Executive Council. The Soviets were even compelled to resort to the mediation of then MK Tuffik Tubi, who was holding talks in Prague. This is not the place to expand on this issue, but hints of this change came from Abu Jihad himself as early as 1986. Let us now return to the logic, if any, of Hamas' Islamic terrorism, and to the possibility of Israel affecting this logic, not only for the sake of a reconciliation but as part of the war against terrorism. Contrary to a widespread perception, Sheikh Yassin is not a member of the Islamic religious establishment. He has no formal religious training and his title of Sheikh points to his role in the Islamic movement rather than to his religious standing. These remarks are not intended to detract from his erudition or from his status among Palestinians. Nevertheless, his stature is due to his mainly autodidactic training, and to his position in a movement whose unique interpretation of some Islamic principles has become religious law in Palestinian society, which is devout but largely untrained in Islamic subtleties, religious commands, or legal precedent. Sheikh Yassin is not the counterpart of Rav Ovadia Yossef in the Shas party, or of Rav Shakh in Degel Ha-Torah, and he is certainly not a holy figure to his followers as are the Lubavitcher or the Baba Baruch. The organizational structure developed by Islamic movements originating in the Muslim Brotherhood does not rely on a venerated religious authority but on a movement with a clear message couched in social-religious terms, headed by a ruler or rulers that are not necessarily omnipotent. Hamas is such a movement, led by an ideological collective rather than by an individual. Ahmad Yassin's high public standing is not necessarily due to his role at the head of Hamas but, inter alia, to his arrest and his elevation to the status of a prominent symbol, not only for committed Hamas members but also for Palestinians as a whole. As noted, Hamas' driving principles a decade after its establishment are derived from two main factors. The first is that Hamas is a classic Brotherhood organization, with the concomitant social emphases. The second is that Hamas is part and parcel of a nation involved in a national struggle, whose main expectation is to end the Israeli occupation and attain political independence. At this stage, it is hard to characterize the Palestinian people as striving for peace. The peace notions of most Palestinians are not derived from the Israeli or Western perception of true peace between countries, but from the strong will of the people to end the occupation, an almost irrational wish never again to see before them Israeli soldiers or Israeli settlers. For Palestinians, peace is a result of what appears to them as a return of their lost honor, as represented by independence and by Israel abandoning the Territories. It need not bring Israelis to despair that they do not seem to share a vision of the future with Palestinians. On many counts, Palestinians have more in common with us than with the rest of the Arab world. For instance, for Palestinians of all classes, including intellectuals, the question of normalization (Tatbi`) with Israel is not in the agenda. This contrasts with the situation in the rest of the Arab world, where normalization is a paramount topic of discussion, particularly among intellectuals and among the more educated strata of society. Palestinians do not show signs of suspicion regarding Israel's cultural and economic imperialism, which have replaced the traditional accusations of Israel's military and territorial imperialism in the Arab world. Palestinians have an enormous advantage over the Arab world: they know us closely and well, including our virtues and flaws. Many among them, in the event of an independent Palestinian state being established in the Territories, would apparently be willing to accept Israel's social-economic "superiority" in the hope of exploiting the advantages of such a situation. Unfortunately, no one has yet written a much-needed comprehensive study abothe renaissance of Palestinian nationalism in the shadow of Zionist-Israeli nationalism, and the possible mutual influences between them. Yet an impressionistic glance unsupported by serious research allows us to identify many elements of Israeli influence from the time of the British mandate until today, and certainly in the period since 1967. At least for some Palestinians, fair relationships between equals with Israel are preferable to close links with the Arab world, which disappointed the trust they had placed in it for many years. These developments must also affect Hamas which, more than any other Palestinian movement in the Territories, has close links with the general public. True, Hamas has not abandoned terrorism in the Islamic garb of Jihad, and will not do so in the near future. As long as terrorism remains acceptable to Palestinians, as shown by the recent suicide attacks, Hamas will persist in it, at least in a cautious manner. If these attacks, or the Israeli reaction to them, become harmful to the general public and cause it to show qualms about them, Hamas will be forced to reconsider their value. For Hamas' leaders, the social and public meaning of their activity is no less important than its religious legitimacy. Nor has Hamas abandoned its anti-Israeli, anti-Zionist, and even anti-Jewish idepositions, and will not do so in the short range. The hope of extending Islamic sovereignty over the whole of Palestine while denying Jewish sovereignty any rights over these areas will remain its basic aspiration. It follows from its belief in the eternal mission of Islam in general, and from the unique interpretation adopted by the Muslim Brotherhood in particular. Yet it would appear, and particularly since the release of Sheikh Yassin and his return to Gaza as the leader of Hamas, that the movement is drawing toward a distinction between hopes and ideals on the one hand, and political activity on the other. On December 20, 1997, it was announced that Sheikh Yassin had declared in an interview he gave to Palestinian TV that "the full liberation of Palestine will be the task of coming generations." Although he made different declarations later, this is a new, even crucial, notion. Yassin's statement immediately reminded me of one made several years ago by Sheikh Abdallah Nimer Darwish who founded and led, until last year's split, the Islamic movement in Israel, another classic offshoot of the Muslim Brotherhood. Sheikh Darwish told me then in his home: "You have a dream of the Greater Land of Israel and we have a dream of the Greater Islamic Palestine. Each side has a full right to hold on to its dream. Ultimately, however, we will have to meet in mid-course." The Islamic dream, with its anti-Jewish connotations, will not die, nor will the Jewish messianism of the Greater Land of Israel supporters. In practice, the logic of a just partition must prevail. In his years of activity in the Muslim Brotherhood in the Gaza Strip, and even before the uprising, Yassin had devoted himself to what could be called his life's work: the creation of a political, social, cultural, economic, and educational infrastructure, which is relatively impressive in the circumstances of the Strip and is also the basis of a communal welfare enterprise. Everything was built according to clear principles defined in the communal organizational doctrine of the Muslim Brotherhood developed in Egypt since the thirties. This infrastructure was built in the course of the twenty years elapsing between 1967 and the 1987 uprising. Israel did not interfere with this enterprise, and was even indifferent to it, revealing its failure to understand the nature of this Islamic empowerment. Led by Yassin, members of the Muslim Brotherhood in the Gaza Strip consistently refrained from any violent confrontation with the Israeli government. Except for one scheme led by Yassin, which was exposed in 1984, members of the Brotherhood had not been involved in hostile activities until the onset of the uprising. Even the conspiracy exposed in 1984 never reached operational stages, although its members did collect weapons. Except for violent incitements against Israel included in their preaching and publications, they were more involved in conflicts with other Palestinian groups, particularly with the "Popular Front," than with Israel. Prior to the Intifada, they had been cut off from their fellows in the West Bank, who considered themselves members of the Jordanian Muslim Brotherhood. The latter, who had maintained correct relations with the Jordanian regime since the Fifties, had no need to resort to the radical and militant approaches prevalent in Egypt, and this affected their supporters in the West Bank. They also enjoyed relatively broad economic backing from the Jordanian government, from members of the movement in Jordan, and from the Waqf institutions in Jerusalem and in the West Bank, where they were well represented. All these issues must be emphasized because, in practice, the Muslim Brotherhood had adopted a form of Hudnah with Israel before the uprising, as the above review shows. Had the uprising not embarked on the violent course it embraced in December 1987, the Brotherhood may not have created Hamas, although the challenge that Islamic Jihad activists posed to the young members of the movement was itself a significant factor in the militant approach adopted by the Brotherhood. The Brothers may have refrained from entering into a confrontation with Israel before the Intifada because they had wanted to devote all their energies to the building of the social infrastructure. One crucial issue worth mentioning in this context is the impressive restraint they displayed in implementing a policy that, unlike the armed struggle sponsored by the PLO as soon as the war ended in the summer of 1967, was highly unpopular. The popular armed struggle championed by PLO factions was supported by a majority of Palestinians in the Territories and brought the PLO important political assets, which came to the fore in the 1976 municipal elections in the West Bank. But the rising prestige of the PLO as a result of its armed struggle against Israel did not spur members of the Brotherhood to change their course. They remained passive witnesses of the violent struggle and, during the Eighties, even began to challenge the PLO's claims to exclusivity, as is mainly reflected in the intense political conflicts that erupted among students at institutions of higher learning in the Territories. Despite the undeclared Hudnah in their struggle with Israel, the Muslim Brothers persisted in their course, unobtrusively gathering substantial backing. Prior to the Intifada, support came to the fore in the universities and, in the course of it, in the enormous following they enjoyed as they "came out of the closet" and joined the violent struggle in the guise of Hamas. Their rates of approval were a surprise not only to Israel but also to the PLO. The logic of Hudnah prior to the Intifada is easily understood and easily explained. Although unpopular, their approach won the Muslim Brothers in the Strip and in the West Bank precious time for building their infrastructure, through a show of restraint and in line with the long-term view dictated by their traditional doctrine of stages. At this time, organizations affiliated with the PLO built their bases outside the Territories, while Israel indirectly "assisted" them by blocking any option of a genuine alternative Palestinian leadership. Thus, from the mid-Seventies, we find that all the rifts within the PLO were echoed almost literally in Palestinian society in the Territories. In contrast, the Muslim Brotherhood became the movement most deeply entrenched in the Territories. Their social infrastructure gradually came to serve the entire population as a substitute of the services that UN welfare agencies could not provide, Israel did not think it should provide, and the PLO and its affiliates provided only for a small section, those active in the military struggle. Before the uprising, and particularly in the Gaza Strip, the Brotherwas the most authentic public organization in the Territories. From the Seventies on, they built themselves up as an alternative to the PLO, not competing for power but as bearers of an alternative message. In both their guises (as Muslim Brotherhood and as Hamas), they questioned the exclusivity appropriated by the PLO in the Palestinian domain. Both in its stage of growth (1964-1969), and after Fatah became the dominant body in 1969, the PLO demanded recognition as the entity completely identified with the Palestinian revolution, with Palestinian liberation and, at the last stage, with the Palestinian State. Posing almost a mathematical equation, the PLO considered itself synonymous with the state, the homeland, and the Palestinian social and political revolution. All wishing to accomplish these aims can only do so within the framework of the PLO. This has been the nationalist perception so far, and most certainly after the creation of the autonomous Palestinian Authority in the Nineties. Two factions/organizations remained outside the PLO for many years, both symbolizing not only a separate organizational frames but also a different ideology: the Jordanian- Palestinian Communist party (which became an independent Palestinian organization in 1982) and the Muslim Brotherhood. As noted, the Communists joined the PLO, which hadrejected them for many years, at the convention of the Palestinian National Council in April 1987 and due to Soviet pressure. The Muslim Brothers continued to stand aside and became even more opposed to the PLO. Even the Intifada, and particularly during its early, more violent stages, did not lead to a rapprochement. Both preserved separate organizations, and also attempted to direct developments by issuing separate proclamations and through a variety of events. The political moderation of the PLO and its readiness to enter a process of political reconciliation with Israel certainly worsened these relations. Two significant factors, which strongly influence its relationship with the PLO and may also have implications for its future relationships with Israel, affect Hamas as a movement with roots in the Muslim Brotherhood. The first is that in other Arab countries as well, and first and foremost Egypt, the movement clearly has no wish to assume power. Contrary to the impression created at times by the media, the Muslim Brotherhood totally rejects the approach favored by Iran's Islamic revolution, namely, that of a regime led by the clergy. Their mainstream approach, and particularly in the last few decades, is to impose the Shaari`a or Islamic law as the only constitution in Arab countries, but without becoming the government. They strive to "Islamize" the Arab world through the law, without necessarily assuming control. Furthermore, Dr. Hassan Al-Turabi, one of their seminal contemporary thinkers and the true ruler of Sudan, is leading today the Islamic attempt to cooperate in Arab efforts toward democratization in the Western rather than in the traditional Islamic sense of the term. In its relationships with the PLO, Hamas strives to Islamize the process of building the Palestinian "state in the making" by emphasizing two elements: first, adopt an Islamic point of view in the struggle with Israel, namely, an uncompromising stand for the liberation of the whole of Palestine, and second, build the institutions of the independent state in the making on a religious basis to begin with. This does not mean that Ahmad Yassin, Mahmoud al-Zahar, Abd al-Aziz al-Rantisi, Gamil Hamami, and other activists in the Hamas leadership wish to take over the government. This implies a weakness as well as a vulnerability - they prefer the ideological message to power and, therefore, do not try to challenge Arafat's leadership or his organization. The second factor follows from the Brotherhood's membership in the Salafi Islamic School, which strives to purify Islam and return it to its original conceptions in all realms of life. According to their approach, anything that undermines this aim is analogous to heresy, and leads to contention and civil strife (Fitnah). This is a recurrent message in their Arab statements, as well as in Hamas publications in Palestine. Resembling the Jewish saying about "the needless hatred that destroyed the Temple," Hamas members repeatedly speak of the danger of a split in the Islamic and Arab world in general, and in Palestinian society in particular. In the early years of the uprising, when the rivalry between Hamas and the PLO seemed close to bursting into mutual violence, the Muslim Brotherhood in Egypt, Jordan, or Sudan did not voice unilateral support for Hamas. Hamed Abu Nasr, the previous "general guide" of the Brothers in Egypt and formally the leader of the international movement, met Arafat every time he visited Cairo and even issued joint statements with him. Hasan al-Turabi from Sudan mediated between the parties instead of serving as Hamas' advocate. Israel even allowed once a senior delegation of Hamas to go to Sudan for talks, hoping this visit would help tone down their activities. Caution and the dread of civil war are peculiar to Hamas in its essence as a classic Muslim Brotherhood movement. This caution is not a part of their essence as a Palestinian organization. The PLO/Fatah would be glad to crush Hamas and overpower it, if given the opportunity and a good chance of success. Hamas does not seek to defeat the PLO by eliminating it, but to prove that the PLO is mistaken and that only the Islamic alternative can succeed. Sheikh Yassin's reevaluation of Palestinian reality following his return to Gaza could thus be guided by two basic assumptions: one is that, although the road ahead may still be steep and rugged, the PLO has crossed the point of no return. In other words: the road to an independent Palestinian state, even if winding, is already being paved. The second and more important one is that the PLO enjoys relatively broad public legitimization to follow this course because of the high expectations it raised in Palestinian society. Crucial issues remain unresolved in the West Bank, such as Jewish settlements built in the very midst of Palestinian areas, turning the maps of the future independent state into a mottled net. In contrast, Palestinians in the Gaza Strip have a more genuine sense of independence, despite a small area of Jewish settlements at its edge. The daily expectations of most residents in the Gaza Strip, as opposed to those in the West Bank, are linked to political independence, but of a kind that enables free employment in Israel. They do not necessarily seek separation from Israel but wish to live by its side, exploiting the advantages that life next to Israel, and perhaps in its shadow, might afford. We must also remember that the population of the Gaza Strip is mostly made up of refugees originating from what is now Israel's Southern coastline (rather than, as in the West Bank, from towns still in existence). If and when residents in the Strip acquiesce to the existence of the state of Israel, their basic problem has no practical solution, as is also true for refugees in the Palestinian Diaspora. Hence, as a community with record birthrates living in a small and densely populated area with almost no arable land, their economic development will go on relying for a long time on hired wages dependent mostly on the Israeli economy, whether within Israel or in the Strip. In this context, Israel may find it worthy to re-examine the effectiveness of closures, and whether they do indeed play any part in deterring or foiling terrorism. In the long range, the benefits ensuing from the contact between Palestinian workers from the Gaza Strip and Israeli society could exceed the benefits ensuing from bringing hundreds of thousands of foreign workers from Third World countries and their problematical integration in Israeli society. Sheikh Yassin, who was arrested and jailed in May 1989, about a year and a half after the beginning of the Intifada and at the height of the uprising, was then part of a reality in Gaza strikingly different from the one twhich he returned in October 1997. Not only because of the "change of government" and the consolidation of Arafat and his people at the head of the Authority, which from certain perspectives and for sure in the Gaza Strip is already almost a state, but because of the enormous expectations raised by the Oslo Agreement. Although he had been aware of events outside during his time in jail, nothing compares to "first hand impressions." If Hamas can be defined as the most sensitive public "seismograph" of Palestinian society in the Territories, then a man like Sheikh Yassin is its "registering needle." Hence, he could make a declaration after his release that implied an almost revolutionary change, viz., the full liberation of Palestine will be the concern of future generations. He preserves the dream of fully liberating an "Islamic Palestine." He does not change the ideology claiming that, ultimately, the struggle over Palestine is only one pinnacle in a perennial Jewish-Islamic conflict that can only end with the defeat of one of the parties. He does not reject the Islamic approach relying on the Quran, and reaffirmed in later generations by radical thinkers such as Sayyid Qutb, that "the Jews are the worst enemies of the faithful" (Surat al-Ma'idah, 82), "the murderers of prophets," "offspring of monkeys and pigs," responsible for all the ruinorevolutions inflicted on modern humanity, etc. He still sees the Islamic Jihad of Hamas as a basically defensive measure against what he considers deliberate and willful Israeli terrorism, thus justifying recourse to all means in self-defense. Furthermore, we do not know for sure that these potential changes in his thinking or in its open displays have begun to trickle down to the last of the wanted members of the `Izz al-Din al-Qassam cells, Hamas' military arm. It is highly plausible that some members of these cells, even at this time, are locating and collecting arms to continue their lethal attacks against Israel and Israelis, including what we call "suicide attacks" and they call "self sacrifice." It is not at all sure that this message can be "trickled down" by decree, even more so because the entire "educational system" of Hamas and is to instill into their young, from the earliest possible age, intense hatred against Jews and Judaism and not only against Israel and Zionism. This hatred does not rely only on Islam and its sources, or on the movement's interpretation of the principles of Islam, but on a strong Palestinian yearning for revenge. The hateful attacks perpetrated by Hamas have enjoyed, then and now, not only religious but mainly social-public legitimization, and this is the crux of the problem in fighting against them. Whether or not religious rulings do allow suicide as a form of defensive Jihad, Palestinians, or certainly some of them have issued their own "rulings" by supporting them as the ultimate vengeance. He who stood as a young boy by a house that was demolished, or saw his father humiliated at a roadblock, or went through the experience of a "vigorous" midnight search in his own house that left behind broken glass and scorched earth, cannot accept the Israeli view of an "enlightened occupation" or agree that, as opposed to their attacks against us, we treat Palestinians with kid gloves. Feelings of revenge are never the result of objective perceptions. Beyond this, Palestinians have undergone a revolution over the last thirty years that, at least partly, has also revolutionized their thinking and led the PLO leadership to show readiness for political compromise. Palestinians in the Territories changed the order of priorities in their collective national tragedy, which is the central element dictating their behavior. Through the Intifada, they largely imposed this change on the PLO. What could be called "the trauma of the expulsion" was replaced by "the trauma of the occupation." The feeling of Palestinians in the Territories, 70% of who were born after 1967, was that the Israeli occupation was no less of a catastrophe than the expulsion of 1948, as a result of which they may find themselves in a situation of existential danger. Their weight in nationalist Palestinian thinking became increasingly significant, but they still failed to create an alternative leadership. The organizational and ideological structure of "outside" Palestinian factions was preserved. Yet this was not only a case of altering the balance of power. Palestinians in the Territories underwent an important social revolution under Israeli occupation: from the mid-Seventies onward, middle class academicians gradually emerged, enabling meaningful social mobility. The development of universities, parallel to the growth of the Islamic and secular social infrastructure and the raising living standards resulting from large-scale salaried work in Israel, gave villagers and refugees a strong push forward. Palestinians had undergone a similar social change in the Fifties, when students in Arab and European countries (particularly Germany) became the leadership cadres of the PLO/Fatah and of other organizations. This development skipped the "aristocratic" families that had been renowned during the British mandate, whose prominence had been based on wealth and property ownership. Yasser Arafat, Khalil al-Wazir (Abu Jihad), Salah Khalaf (Abu Ayad), Farouk Qadumi, Dr. George Habash and Dr. Naef Hawatmeh, Ahmad Jibril, the brothers Hani and Khaled al-Hasan, and other members of the first generation of the Palestinian revolution, were not born to families that had been considered influential during the British mandate. They came up through student organizations in the Arab world and in Europe, which had espoused ideologies of social revolution through various means, some violent and some popular. One of the important committees in the "Western area" of Fatah, the central body in charge of terrorist operations against Israel headed by Abu Jihad, was the "organization committee." This committee was made up of students and academics, and served as a catalyst for large-scale recruitment into the political and military activities of the PLO. Its leaders were among the intellectuals who flourished in Arafat's surroundings during their years in Lebanon. Some collaborated with Abu Jihad in the creation of a faction of the Islamic Jihad linked to Fatah, whose commanders were executed in an assault in Limasol, Cyprus, in February 1988. A similar transformation has taken place in the Territories, visible in the Palestinian leadership that has emerged over the last decade. Jabril Rajoub, Muhammad Dakhlan, Saeb Arekat, Saer Sa'ad and others, are a classic product of this change, signs of which can also be gauged among Islamic elements growing up in the Territories. The Hamas leadership is chiefly made up of members of the refugee generation with no claims to ancestry, who grew up in a society placing increasing emphasis on education as the catalyst to upward mobility (Israeli/Jewish influence? ): Ahmad Yassin, Dr. Mahmud al-Zahar, Dr. Abd al-Aziz al-Rantisi, Ibrahim al-Yazuri, Dr. Ibrahim Maqadmeh, Dr. Jamil Hamami, the late Dr. Fathi Shqaqi, and his successor to the leadership of the Islamic Jihad, Dr. Ramadan Abdallah Shalah. All are a product of this social change. The Muslim Brothers went even further when they took over the Islamic University in Gaza during the Eighties and turned it into the focus of their activity, let alone into the largest institution of higher education in the Territories. This social change was also very significant in shifting the Palestinian center of gravity from the Diaspora or the Exile to Palestine itself. There is more, however. The transition, the social change, and the process of building social and political institutions in Jerusalem and in the Territories prior to the Intifada was accompanied by the introduction of a relatively democratic political culture. The entire infrastructure of Palestinian institutions in the Territories: unions, youth committees, women's organizations, students' councils, professional organizations, cultural and social associations, chambers commerce, voluntary organizations, agricultural leagues, etc. - was, from the start, premised on yearly elections. These elections came at the end of intensive, and usually fair, campaigns, which imprinted Palestinian society in the Territories with a democratic, stamp. The division of the various groups according to the various organizations within the PLO on the one hand, and independent parties such as the Communists, the Muslim Brotherhood, or the Islamic Jihad on the other, created a pluralistic society characterized by a level of political awareness quite exceptional in the Arab world. The result is a society with a highly developed public opinion, and with more than one movement or faction vying for power. The political culture that evolved in the Territories is closer, to some extent, to that prevalent in Israel than to the norms of the Arab world. Those who consider Arafat a dictator should actually wonder at his ability to maneuver between opposing lively factions in a dynamic society, particularly after he moved to the Territories and became head of the Palestinian Authority, as well as in the Lebanese and Tunisian era. The social and personal changes in the national Palestinian leadership are also what enabled a rapprochement between the trailblazers of the Oslo process, which hammered out a political compromise between Israel and the Palestinians. M`Abas (Abu Mazen), Dr. Nabil Sha'at, Ahmad Kari` (Abu `Ala'), and their associates, rose to prominence outside the PLO's military establishment. So did Dr. Yair Hirschfeld, Dr. Ron Pundak, Dr. Yosi Beilin, and Uri Savir, who led the move on the Israeli side. In many respects, they shared a political culture that enabled a mutual understanding. The leadership of Hamas, although heading an Islamic organization that is not inspired by Western concepts of democracy, must take all these issues into account. Moreover, since Hamas is not led by a "Council of Elders" and has no venerated religious authority, it tends to act as a collective. Its leaders too are a classic product not only of the social changes that have taken place in the Territories, but also of a fundamentally Western political culture. Some of them emerged in the election campaigns at the universities beginning at the early Eighties. Men like Mussa Abu Marzuk and Haled Mash'al in Jordan, or Yaser Za'atra in London, as well as other less well known figures, have studied at American and English universities. Whatever the Islamic radicalism of Hamas members, they are not "obscurantist fundamentalists" of the Iranian stripe (nor are all Iranians). They are not willing, then, to reject all the advantages of Western culture, even when they refer to it as "Crusader and heretic." There is also increasing evidence that the idea of Hudnah with Israel might be acceptable to circles in the "political chamber" of the movement abroad, and has also found its way to the pages of Filastin al-Muslimah published in England, which excels at conveying Hamas' views. It is also worth noting that a concrete proposal, though we do not know how serious, was conveyed through King Hussein in the name of a Hamas member residing in Jordan, apparently Mussa Abu Marzuk himself. The answer to the question posed in the title, then, seems to be yes. Hamas can decide on a pause, even a prolonged one, in its struggle with Israel. It can not only in the sense that it has the ability to do so, but also as part of a sober perception of the changing reality in the Territories. The political, social, and military activists of the movement will find it harder to see the daily change, as they are part of it. But Sheikh Yassin, who was cut off from his surroundings for nine years, can definitely see the vast changes in the Territories that followed the process of political compromise, as well as the new reality that emerged with the creation of the Palestinian Authority. As one whose life's work is linked, first and foremost, to a social revolution rather than to terrorism for its own sake, he may also be more qualified than his fellow leaders to assess the expectations of Palestinians in the Territories, and tone them down. Sheikh Yassin may himself have experienced the shift in the weight of the Territories in the Palestinian context. He may not only have moved from the "trauma of expulsion" to the "trauma of occupation," but may also have changed the order of priorities in the existential problems affecting the Islamic world. He began, when leading the Muslim Brotherhood in Gaza, by seeking solutions to the global Islamic problem in its contest with Western culture. He later shifted his focus to a violent solution of the Palestinian problem, with the establishment of Hamas at the outset of the Intifada, and is now making Palestinian independence at least in part of Palestine, and liberation from the Israeli occupation, the top priority. Signs of Islamic support for an approach placing liberation at the top of the list were already visible at the beginning of the Intifada, when Arab Islamic elements rejected Hamas' total denial of the PLO. Fahmi Huwaydi, a well-known Islamic writer and thinker in Egypt, wrote a long article in November 1988, immediately after the Palestinian declaration of independence. The article, which was carried by several important Arab papers, was entitled "What comes first - An Islamic Palestine or a Free Palestine," and his conclusion was that the first priority is the liberation of Palestine. The course chosen by the Palestinian leadership, then, seeking to remove Israel from at least part of the Territories through the uprising, is preferable to the efforts devoted to liberate Palestine while also fighting for its Islamic character. Hamas members responded by giving precedence to the struggle for a greater Islamic Palestine. Sheikh Yassin, who was jailed when Hamas upheld the ideal of a greater Islamic Palestine at any cost, was released when Palestinian independence, even if partial and certainly in its Gaza Strip guise, appears closer than ever. Furthermore, although the process of compromise with Israel appears to be stalled, Palestinians everywhere realize that Israel has also entered a path of no return as a result of the expectations of its own citizens, and that patience and moderation will bring them closer to their desired aim. It would also seem that most Palestinians in the Territories are not interested in a mutual war of attrition between Hamas and the Palestinian Authority. They too, like the Jewish public (again Israeli influence? ), seem to sense a need for a "national reconciliation," which Sheikh Yassin is best suited to lead. No quick process of moderation, if any, should be expected. A movement like Hamas can easily speak in several tongues to different audiences and, if required, bestows Islamic approval on all versions. Clearly, and at least in the short range, we will see no moderation in the ideological attitudes toward Israel and the Jews. A change in Hamas' thinking can only come from a true assessment of the new reality, and a profound evaluation of how to exploit it to expand its ranks and its influence in the conflict with the PLO or the secular national movement, which is no less important. It must also be clear that a change of this magnitude within Hamas will exact a heavy price from Israel, from a massive release of prisoners and detainees and up to vast changes in an Israeli-Palestinian understanding, in the direction of an independent state in all the Territories and without any or almost no settlements. The moderation of Hamas may also strengthen Arafat's bargaining power just before the beginning of negotiations toward a possible final settlement. For some Israelis, signs of moderation within the movement will be a tragedy helping to speed up our exit from the Territories, just as the Oslo agreement was, and still is. It is important for Israeli society to know that signs of political moderation are also possible within Hamas, which is perceived as inflexible, and could ensure a pause in its terrorist struggle under the Islamic cover of Hudnah. It must be noted thatthe present process of compromise between Israel and the Palestinian authority differs from the peace agreements Israel signed with Egypt and Jordan, and may sign with Syria in the future. These peace agreements were signed by regimes that imposed them on their citizens while most of the people, and particularly its most educated classes, have never accepted them wholeheartedly, to say the least. In the case of the Palestinians there is a process of compromise, even if slow, involving also the two peoples who have been chafing against each other for the last thirty years. The central emphasis must be on the word process. Like the Palestinians, Israeli society underwent and is still going through a process of transition - from a total denial of the other side to a gradual, if changing, willingness to accept the claims of the other, despite a long series of lethal suicide attacks. Until Ten years ago, the need for various forms of a dialogue with the Palestinians had involved only marginal elements in Israeli society. Today this is acceptable to much wider circles, including those who had only recently rejected any notion of a settlement. The struggle against terrorism, then, is not exhausted by preventing individuals or foiling conspiracies, but also by an attempt to expand the process. Since Rabin's assassination, Israeli society is showing less and less tolerance for attacks against Arabs or even for displays of "verbal violence" against them. Since October 1995, those who refuse to reach any compromise with the Palestinians have been pushed into a defensive position by a majority of Israelis. Through the process of compromise, Palestinian society must be brought to understand that it is an inseparable part of the struggle against terrorism. For Palestinians, a central feature in this context is that the process of compromise also entails changes in their perception of the threat represented by Israel. The need for a study, yet to be attempted, on the mutual influences between Israelis and Palestinians was mentioned above. Another crucial area of research still awaiting us concerns the sense of an Israeli threat, in the Arab world and among Palestinians. Israeli society developed on the premise of a perceived threat from a hostile Arab world surrounding it, together with the Jewish perception of "the whole world is against us." The state of Israel and Israeli society never stopped to check the reverse side of this principle: perhaps the root of the problem is also (certainly not only) that the Arab world in general and Palestinians in particular fear us. Fears of this type can often play a substantial, and certainly legitimate, role in the deterrent represented by a regular-armed power or in regular wars, but also in terrorism. Such fears, however, can also create terrorism. Terrorism is defined by many as the "weapon of the weak," but this definition carries derisive connotations, often lacking a deeper attempt to understand the sources of weakness and whether it is true or false. From the time of the British mandate and the expanding Zionist settlement in the Territories, through the uprooting and disintegration of 1948 and the occupation of the whole of Palestine in 1967, Palestinian society in the Territories lived with the sense that it stood before a threatening and insatiable power, devouring everything on its path. Palestinian terrorism, national or Islamic, was not only aimed at hurting and harassing Israel in the knowledge it could not destroy it, but was always the type of terrorism combining social revolution and political liberation. Since the Sixties, Palestinian terrorism was meant to steel Palestinian resistance and build a social "backbone" toward the contest with the "terrible and threatening" enemy. Fatah and the various Popular Fronts have always upheld revolutionary ideas from various sources, including not only political freedom and national independence but also "the building of the new society and the new individual within it." The Islamic movements, headed by the Muslim Brotherhood, have the same aim. Furthermore, until the Intifada, the Muslim Brotherhood considered that social amendment preceded the terrorist struggle against Israel. The Brothers see themselves within the Muslim Arab world, and particularly in the Palestinian arena, as the element contending with a threatening global conspiracy that is essentially cultural, where the Jews and Israel play a crucial role in mobilizing "Crusader" Western culture. The solution is not only in a return to the sources of Islam and the creation of a society that is strictly religious, but also in raising Jihad to the top of their priorities as the only means of building the indestructible backbone of Palestinian society. But the Jihad of the Muslim Brotherhood, and hence of Hamas, need not come to the fore, as most Israelis believe, only in terrorism. Their basic assumption is that this Jihad is a form of self-defense against the Israeli threat. The Islamic justification of Hamas' suicide attacks originates in the same defensive perspective, and thus easily allows for the adoption of a course ostensibly forbidden by religious law: suicide. The assumption is that Muslims in the modern world are subject to a permanent cultural threat, and only through Jihad will they secure the "backbone" suitable for contending with it. Jihad begins with a return to the faith, with the building of an Islamic society around it, and with the ability to resist the evil instinct and the temptations of the secular world. Israel is thus uniquely equipped to serve as a threat, not only because of its military power or because of the land that, in their view, it pillaged from the Palestinians. It is also a threat because of its cultural-social influence, which Islamic elements could not but notice. This approach requires the building of a society with the courage to struggle, based on a heroic vanguard showing the way to all. Islamic terrorism, then, is not only a response to the weaknesses detected in Israeli society, as many tend to believe, but also conveys the sense of a threat. The process of compromise with the Palestinians can be perceived as a show of restraint on the Israeli side reflecting weakness and a tired society that has lost its ability to make a stand. It can also be seen, however, as a threatening influence to Palestinians, a clever neutralization of their national leadership and its will to fight. The Intifada, a popular spontaneous uprising, can be viewed as an attempt to remove the yoke of an oppressive occupying power. But it can also be viewed as a cry, in the full sense of the term, of a society that feels threatened but also abandoned. It was abandoned by the Arab world when its most powerful component - Egypt - turned to the peace process with Israel; it was abandoned by the PLO, which was forced to move to far-away Tunisia in 1982-1983; it was abandoned by Syria, whose only contribution to the Palestinian issue was to foster rejectionist attitudes to every solution without suggesting a plausible solution of its own. The road accident on December 8, 1987 symbolized the Israeli threat in an almost picturesque, if tragic, fashion: the giant military semi-trailer smashing into a vehicle carrying weary laborers back from a day of work in Israel. Whoever seeks further parallels should look at the many caricatures drawn by the prominent Palestinian artist Naji al-`Ali who, in a rather ironic twist, was murdered in London by Fatah emissaries in the summer of 1987. The process of compromise with the Palestinians, which some in Israel view as reflecting a weakness and leading to a much greater one, did not arise on the Palestinian side from an approach seeking to exploit Israeli vulnerability, but from a perception of Israel as less threatening to Palestinian society. Palestinians gradually learned to exploit Israeli democracy, and first and foremost it's legal system, in order to absorb the political culture of Israeli society. The Palestinian press published in East Jerusalem in the Eighties often devoted about half of its pages to translations of articles from thIsraeli press. Tens of thousands of Palestinian laborers who have worked in Israel over the years, particularly in the Dan area, encountered Israel's affluent society, its restaurants and entertainment locales, its malls, and other signs of the Israeli bourgeoisie. Another issue worth mentioning in the context of Hamas as an Islamic movement of the Muslim Brotherhood variety is the moderating influence of Israeli Arabs, as a possible link between us and the Palestinians. For many years, slogans were spread about "Israeli Arabs as a bridge to peace between us and the Arabs." Most of these slogans, which were usually voiced by "consultants on Arab issues" at professional gatherings, were merely lip service. They were also usually directed at our relations with Arab countries rather than with the Palestinians. In practice, there was never any real recourse to Israeli Arabs as a bridge of any kind. Quite the contrary, any possible affinity between them and Palestinians in the Territories was perceived by government circles and by academic scholars with great suspicion, as a sign of "radicalized Palestinization." Only over the last few years have both sides openly acknowledged the centrality of the "Israelization" process affecting Israeli Arabs, a process with important consequences at the political and social levels. The close contacts between Israeli Arabs and residents of the Terrhave also helped to diminish, directly or indirectly, the Israeli threat to Palestinians. For Palestinians, the political and social development of Israeli Arabs - despite feelings of discrimination and oppression, sometimes-intense ones, still prevalent among them - is a sign of their integration in Israeli society. The PLO was the first to understand this when, as early as the Seventies, excluded Israeli Arabs from the armed struggle against Israel. Gradually, the PLO assigned them the political role of influencing Israeli public opinion by exploiting the rules of the Israeli political game as well as through demography. They were aided in this, although not deliberately, by the Israeli Communist party, which acted both as a catalyst and a barrier concerning three important developments. The first was its recognition of the state of Israel as concretizing the self-determination of the Jews in the land of Israel, and the need to struggle for the establishment of a Palestinian state next to Israel rather than instead of it. The second was the party's attempt to direct the Arab minority in Israel to seek maximal integration, making the struggle for equal rights a major priority. The third was to direct the Arab minority to struggle within the framework of the law, rigorously adhering to the rules of the game. Eventually, the membership became mostly Arab and later mostly Muslim, leaving behind the period of Jewish-Christian dominance in the party. The party thus acted as a barrier, preventing Israeli Arabs, except for isolated instances, from joining the Palestinian armed struggle, namely Terrorism. The process of "Israelization" at the social level, which could also be seen as "gentrification," added the dimension that made the struggle within the framework of the law more advantageous. Politically, the same signs of ethnic, ideological, and class strife characterizing Israeli political organization affected Arabs in Israel. This process has prevented all along, and will apparently continue to do so in the near future, the creation of a large and united Arab coalition. Social "gentrification" has also preserved the clannish features of Arab society in Israel, which have also added to the political-social-economic strife. Israeli Arabs have absorbed the characteristics of the majority society and, consciously and unconsciously, have transferred at least an acquaintance with these characteristics to Palestinian society in the Territories. They have thus served, unintentionally and certainly not consciously, and clearly not as emissaries of the Israeli government, as a kind of "bridge to peace." The emergence of the Islamic movement in Israel, which last year split into two rival movements, has intensified divisions among Israeli Arabs. The Islamic movement in Israel, which is also an offshoot of the Muslim Brotherhood, is a twin of Hamas except for the violence, and some of its growth was influenced and perhaps directed by the Muslim Brotherhood in the West Bank and in Jerusalem. But the Islamic movement in Israel, and particularly under the influence of Sheikh Abdallah Nimr Darwish, has always remained within the political consensus acceptable to the decisive majority of Israeli Arabs: the independent Palestinian state must be established beside rather than instead of Israel. For its leaders and members, this will be the reality until the establishment of one great Islamic state in the "messianic era" that will encompass the whole Arab world and swallow up Israel, either physically or through cultural strangulation. This Islamic "messianic era" will be, as Sheikh Yassin has declared, "a matter for the coming generations." Hamas, like the Islamic movement in Israel, may be descending from the "Olympus" of a solution to all the problems and misfortunes of the Islamic world, to the narrow domain of a direct Israeli-Palestinian confrontation, and to the limitations arising from taking into account the yearnings of most residents of the Territories. Furthermore, it must be noted in this context that some leaders of the Islamic movement in Israel were in close contact with Sheikh Yassin during his imprisonment. The Israeli citizen closest to him through these years was a lawyer, Abd al-Malek Dahamshe, who is today an MK. Dahamshe supports Darwish within the Islamic movement, namely, the faction that was more willing to accept the Israeli rules of the game and even stand for election, which was the reason for the split. Sheikh Darwish himself was also in contact with Ahmad Yassin, directly or through Dahamshe. Both may, now and in the future, be able to influence certain attitudes of Hamas in the new circumstances created with Yassin's release and his return to lead the movement. Another factor worth noting in the context of a possible hiatus in Hamas' violent activity is the price that will be demanded from Israel in exchange, beyond the concessions agreed in the settlement with the national leadership. Almost the only "goods" of any worth to Palestinians in the Territories in general, and to Hamas supporters in particular, are the Palestinian prisoners. This is a matter of the utmost importance in Palestinian society, and the Israeli public may not be fully aware of its significance. These "goods" are not only a means for attaining political aims in the reconciliation process, but a crucial criterion in the mobilization of Palestinian public opinion to continue developing expectations about the future. The prisoners' issue is also part of Israel's deterrent capacity in its struggle against terrorism and political violence, but Israel appears to be much less sensitive to this question than the Palestinians. An intelligent handling of this topic might broaden the public level of support for the process, putting pressure on Hamas and perhaps increasing its readiness to join, even only partially, the process of Israeli-Palestinian reconciliation. One factor may set back the whole process, and certainly the chances of any change, if at all possible: the issue of Jerusalem. For many Palestinian and Arab Muslims, a unique holiness has gradually come to surround Jerusalem in general and the Temple Mount (Bayt al-Maqdas) in particular over the last three decades. "The holiness of Jerusalem" in the Islamic, Arab, and Palestinian myth of our time, which far exceeds the myth surrounding Jerusalem as known to us from traditional Islam, has largely replaced the attitude toward Israel as the unifying element. This issue requires independent research and separate consideration, but is a matter of almost universal agreement in the Arab world and among Palestinians. Gradually but steadily, the political-national demand for the proclamation of East Jerusalem asthe capital of the future independent Palestinian State has blended with the holiness of the Temple Mount in the Arab world. In sum, it appears that we are at the height of an ongoing process, in which both parties affect each other more than they are aware of. The very existence of a process is an important move, not only for the future of both nations and the chances of a political-national settlement. It is important and vital as part of the Israeli struggle against Palestinian political violence, including that of Hamas, but it also forces Israeli society to embrace the hallmark of Hamas - Sabr -"endurance." The struggle against Palestinian Islamic terrorism must be waged in a far more systematic and intelligent fashion, taking into account not only the "pinpoint target" of foiling specific plots, a justified concern in its own right. It should begin by bracing Israeli society and public opinion into recognizing that other answers, besides "running after it," are also available. Steps must be taken to lessen the "demonization" of Islamic terrorism and the enormous weight it has assumed in Israeli society. 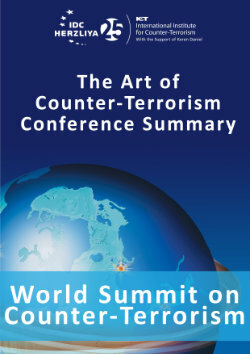 The most effective way of contending with Islamic terrorism and with Hamas is to , as far as possible, elements that affect Palestinian public opinion in the Territories, bringing it to raise its threshold of expectations from Hamas as a social movement integrated within the short-termimmediate aspirations of Palestinians in the Territories. For this purpose, Israeli society must learn to "sleep with the enemy," relying on the assumption that this enemy, including its most extremist elements, is capable of it as long as the present process of compromise continues.